Deshazor Everett. Malcome Kennedy. Howard Matthews. Cedric Ogbuehi. All these seniors and many more achieved something that no other A&M recruiting class has accomplished. They won 4 bowl games. It wasn’t always pretty, and yesterday’s game seemed about as messy as the 2014 season. But in the end, the senior leadership and the underclass talent forged together to win the Liberty Bowl. Offensively, the Aggies established a run game for the first time since 2012. Led by junior running back Tra Carson with 133 yards, the Aggies notched 235 yards on the ground. The last time A&M had a running back gain over 100 yards in a game was November 3, 2012 when A&M beat Mississippi State behind a 112 yard effort from Ben Malena. The running game opened up the passing attack for Kyle Allen who found Trey Williams for 1 touchdown, Malcome Kennedy for 2 touchdowns, and Josh Reynolds for his record breaking 13th touchdown on the season. Reynolds stands atop a very impressive receiving record that was previously led by Mike Evans and Jeff Fuller at 12 each. Impressive company to say the least and this guy is only a sophomore. The day was far from done as true freshman quarterback put up his best performance of the season. His 4 touchdown passes in a bowl game tied Johnny Manziel’s record from last year. Additionally, he impressively eluded a sack and scrambled for a 14 yard touchdown run, his first of the season. Defensively, the Aggies performed admirably holding one of the Big12’s top offenses to just 30 points (7 points came from a pick-6). WVU quarterback Skyler Howard got rolling early with a 45 yard touchdown pass to put the Mountaineers up 10-7 when he gave his best Johnny Manziel impression. But after that crazy first quarter the defense clamped down. They allowed just 17 points in the final 3 quarters with one of those touchdowns coming near the end of the game. Skyler was limited to 20 of 45 passing, a 44.4% completion rate. He also had difficulty extending drives in only going 5 of 19 on 3rd downs. Plays were made across the board as freshman and seniors alike contributed. Freshman safety Donovan Wilson led the team with 9 tackles barely beating fellow freshman linebacker Otaro Alaka with 7. Seniors Howard Matthews and Tommy Sanders laid some bone-crushing hits of their own. 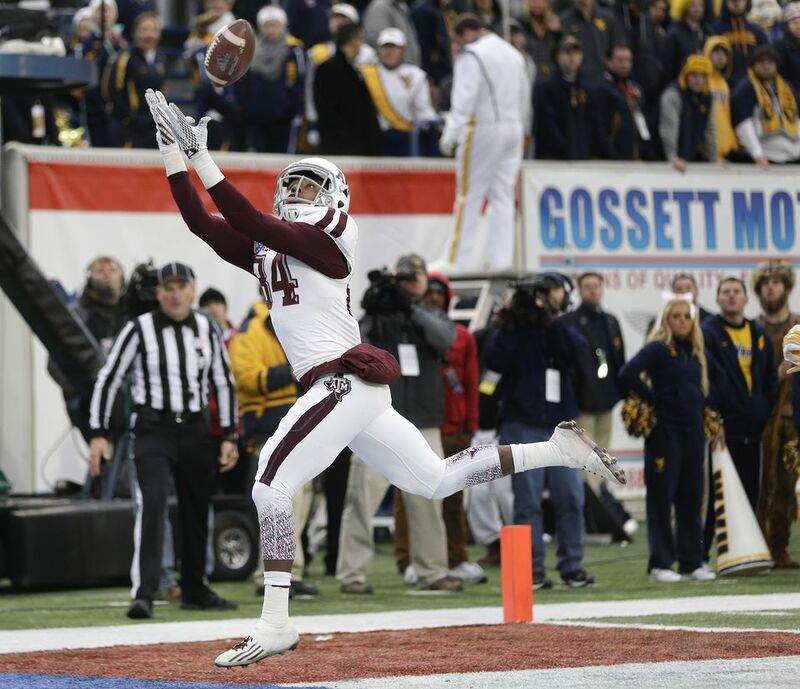 And in the end, the Aggie defense did just enough to keep this one out of reach. By some accounts, this 2014 season is a disappointment. The Aggies upset top-10 South Carolina on the road and climbed as high as #6 in the national rankings. But all of that turned out to be smoke and mirrors as the Aggies dropped three consecutive conference games in embarrassing fashion. This team lost 3 first round offensive talents to the NFL Draft and several starters on defense. It was more than enough to expect growing pains. But instead of caving after a horrible performance in Tuscaloosa, the team grew up behind a new leader in Kyle Allen. With the right defensive coordinator and solid position coaching hires, this team could be in for a special season next year. Only 249 days until kickoff. Previous PostKyle Field ImplosionNext PostLSU’s John Chavis to be A&M’s next DC?